Please note that the Victorian Branch of the Richard III Society has a new website and a new address. We wish their webmaster Gillian lots of success with their new project. The December issue of the Ricardian Bulletin is starting to arrive in Australia! Congratulations to the Bulletin Committee on a wonderful new issue. Not only the contents are very appealing, but so is the new style with full colour throughout. And it got here extremely quickly, virtually at the same time as for members in the UK. Hoping yours arrives soon, too. If you are a member of the NSW branch and have not received your copy by 14 December, please let me know at publications@richardiii-nsw.org.au. 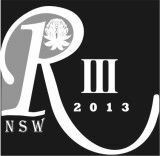 The AGM of the NSW Branch of the Richard III Society will be held on 12 October 2013 at 14h00 at our usual venue, the Harry Jensen Centre, 17 Argyle Street, Millers Point. As it is every year, the AGM is your last opportunity to renew your subscription. If you haven’t renewed your subscription by sending your Renewal Notice and indication of payment (either by cheque or direct credit) to our treasurer Judy by Friday, 11 October 2013, you will be able to do in person at the AGM. Please make sure that you bring payment AND the filled in Renewal Notice with you. There will be a few changes to the composition of the committee on the cards, with some members stepping down. We thank them for their tireless work on behalf of all of us. However, we also thank those, who have bravely put up their hands to become part of our branch committee. And after all the housekeeping, there will be a fascinating talk. Unfortunately our scheduled speaker had to pull out at short notice, but Judith will come to the rescue and tell us about ‘Innovations of the Middle Ages’. This promises to be an interesting topic. One innovation coming to my mind immediately is Johann Gutenberg and the printing press. We must not forget that Richard III was a strong supporter of printed books, as he explicitly exempted them from the import and export restrictions in the statutes of his only parliament. Incidentally the statutes of the 1484 parliament were not only the first to published in English, but also the first to be printed. So come along and join us to decide on the future committee of YOUR branch and find out which innovations can be traced to the Middle Ages. Most Society members should have received their September 2013 Ricardian Bulletin during the last days. Should your copy not have arrived by the AGM, please let our Bulletin coordinator Dorothea know. Niclas von Popplau reports after his visit to Richard III in spring of 1484 that the king employed a choir which performed ‘the loveliest music I have ever heard in all my life’*, so we can guess that Richard appreciated good music. Therefore I am sure he would also appreciate the music which is now written in his memory. Here are two examples. Graham Keitch wrote a beautiful choral piece ‘In memoriam Ricardus Rex’. Listen to it here. And a little hint for all who attend the Australasian Convention in July, it might very well feature there as well. The Richard III has hosted an orchestoral piece by Robert Draper. You can find out more about this and of course listen to it on the website of the Richard III Society here.